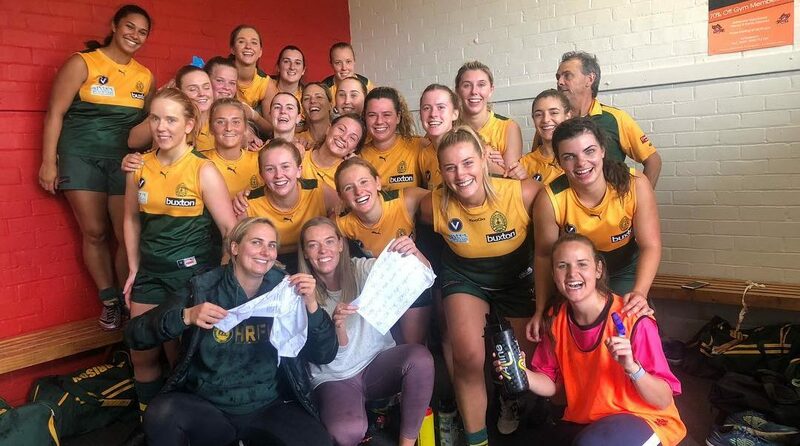 It’s been a long time coming, but on Saturday the Hampton Rovers Senior Women’s team were victorious for the first time since the 2017 season – 660 days to be exact! Following a winless 2018 season in which the girls did it extremely tough but never gave up (after winning six games in their debut season), the team finds themselves in a better-suited division this year and after a good first-up performance in round one, ran out convincing winners in the round two clash against Swinburne University AFC at St James Park. The Rovers held their opposition goalless in the first half and restricted them to just the one major for the game. Two goals in the first were followed by three in the second to lead by 30 points at the main break. Six goals in the second half propelled the Rovers to a 65-point win and the video of the girls singing the song (many for the first time) on the Rovers Instagram account told the story! To say they were in high spirits is an understatement. It was also the first win for second-year Rovers Women’s coach, Paul Curry, and it was certainly plenty of reward for effort. Great to see the Rovers finally found the goals with Taylan Merrick & Mandy Naylor (released from the backline), both popping through three and Kate Holden (the President’s niece – playing her first season at the club) kicking two and setting up several others in a sensational performance. The girls were back at the Boss following the game cheering on the Seniors and they were an even happier team afterwards when President Nash shouted the bar for the girls and they certainly took advantage of his generosity! Following the Easter break, the girls are back at Castlefield Reserve taking on Bulleen Templestowe at 10:30am on Saturday 27 April.